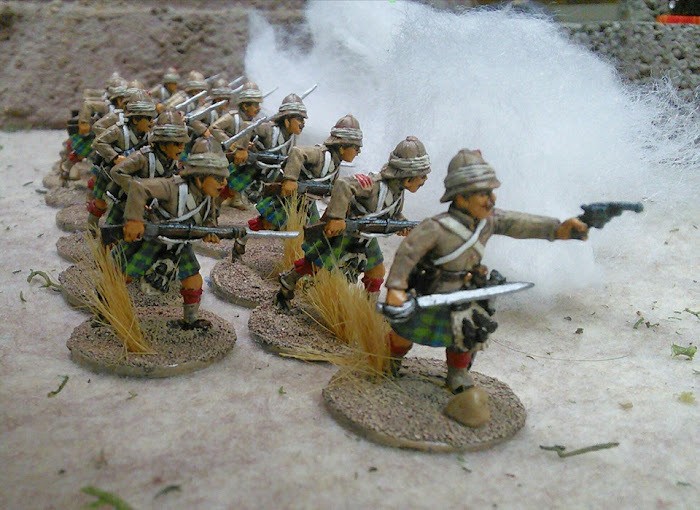 Last August I showed you this square of 15mm British Colonial figures and hordes of Mahdists. Well I've finally gotten the middle of the square finished up. I almost had these guys done at the end of February as well, but as mentioned earlier, I didn't pick up my paint brushes all of March and into early April. Here are some 15mm Essex baggage camels, some beef cattle of unknown manufacture, a trio of Essex senior officers and more artillery from Peter Pig. I used a Minwax wash to pick out the fine details and then highlighted some things like the sailor hats afterwards. The Victorian chaps in front are a birthday present for a friend, which I should have done before his next birthday. I'll show them off better once they're done. The masses of Samurai are finally assembled and you will be hearing more about them as well, I'm sure. Just finished my first platoon for Chain of Command. Actually they have been almost done for over a month now, but March was a wash out for painting. Instant platoon! Just add LMGs. Over a year ago, I decided to remove the 5th figure from all my Flames of War style stands of German infantry, to make the sections 8 figures strong. Most of my Lardy scenarios involved reduced 8 figure sections and it confused people to have 2x 5 figure stands representing only 8 men. Letting them run with 10 figures per section put them at a distinct advantage over my Canadians, too. I thought the spares could be used for making change when the sections take casualties and rebased them on small squares in ones and twos. Well back in December or January, when I was prepping my Canadian and FJ platoons for CoC I realized that with 3 platoons, each of 4 sections, I had enough spare German riflemen to make another platoon for CoC! I had to attack some of the 3 figure FoW style command stands (which I've never actually used) for a couple more riflemen and some leaders. These were all put together back when I used epoxy to glue the troops to the bases! Gads, what a battle to get those off. Some I gave up on. Basic landsers got glued to 4Ground 15mm round bases. Big Men got glued to 20mm washers. All I needed were some MG42 teams. Fortunately I had a half dozen prone teams squirreled away. They're Old Glory figures, not sure where I got them from, probably in a trade with someone. I used the now cleared off small FoW stands (why waste them?) to base them on and had them primed and black undercoated by the end of February. Where they sat until this weekend. Got them painted up in about an hour before going to Mass on Good Friday. With the extra MG42 teams the unit can be played as a run of the mill Grenadier platoon with 7 riflemen, one MG42 team and a leader per section or as a Panzer Grenadier platoon with 5 riflemen, 2 MG42 teams and a leader per section. I also had a couple of sample figures I got many years ago from Resistant Roosters who had been knocking about looking for a home. So they are a 7th MG42 team, just in case I need them. Because you never know. I should attack those FoW command stands again and free up some fellows with AT mines to give them a tank hunter team. The Canadians won't take long to paint up, they actually got their base khaki on before the painting hiatus, but the FJ and their camo will be longer. It all looks terribly complex. There are interesting deployments like "Birds in Flight" and "The Crane". There's a lot of depth. A lot of thin lines of different troops. There's a lot of flags! I think 'traditional' wargame units of 2 or 3 ranks would not be correct and not give the frontage required. You can see his full break down of the command structure and organization on this forum. I can only hope Evalerio puts out a book on all this. 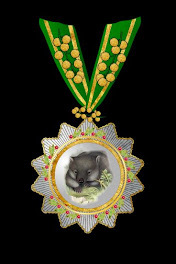 But from what I can sort out; it seems the mon, or badge of the Daimyo (great lord) is the unifying element. All ashigaru and lesser samurai would wear his mon. Different colours could be used to designate different divisions. 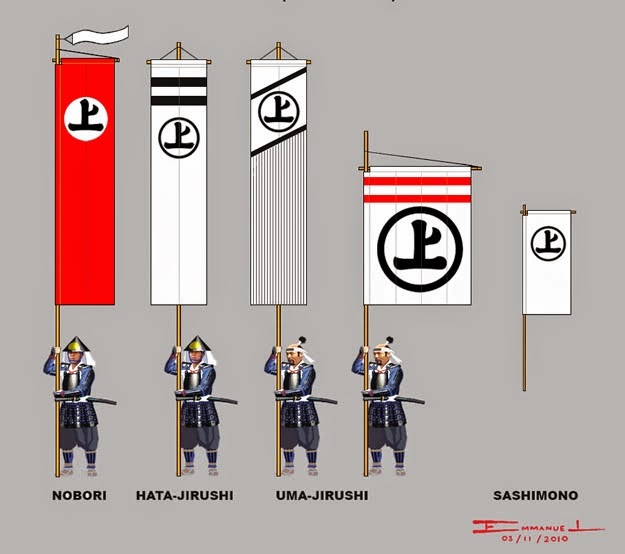 Horizontal and diagonal stripes on the nobori and sashimono could be used to designate units within a division. 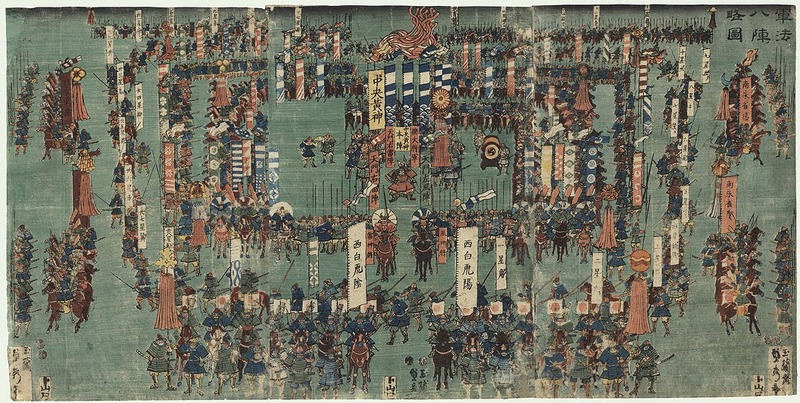 Higher ranking samurai, commanding divisions under the daimyo, would be allowed to display their own device on their uma-jirushi. 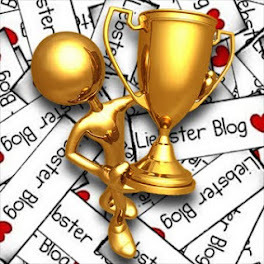 Of course, I could be wrong. But it's a start. I'll need more flags. A lot more flags. I used my Bring and Buy income to order the first contingent of Perry figures. A mix of teppo, yumi, and yari armed ashigaru and mounted and dismounted samurai. Enough to make a couple of buntai for Ronin. I also got some civilians because I like to have them on the table top. Plus, peasants carrying burdens will be a start on the rear echelon for my Samurai army.